Not long ago, I sat down with Pac-Man CE DX, the new sequel to 2007’s stellar Pac-Man: Championship Edition for Xbox Live Arcade. Like its predecessor, DX is a Pac-Man style maze gobbler with a shifting layout and a strict time limit, forcing you to go for the highest possible score before time runs out. DX adds in a “ghost train,” wherein sleeping ghosts around the maze wake up and begin chasing Pac-Man. Provided you don’t get yourself trapped—think Snake—you can use the train to rack up huge scores, grabbing a power pellet and chowing down on dozens of ghosts in one fell swoop. I’d had a nagging feeling that this reminded me of another game, but I couldn’t pinpoint what. It wasn’t until my riveting game of Centipede at Ann Arbor’s Pinball Pete’s that my memory jogged: DX smacks of the Magnavox Odyssey2 game, K.C.’s Krazy Chase! That game was a curious mash-up of Centipede and Pac-Man, deliberately designed to prevent a lawsuit from Atari—a fate that had befallen the game’s antecedent, K.C. Munchkin. K.C. Munchkin, released in 1981, was a huge hit for the Odyssey2, at least for its brief availability on the market. Beating the 2600’s notorious Pac-Man port to home consoles by nearly a year, Phillips, the parent company of Magnavox, found themselves on the receiving end of a lawsuit by Atari, who argued that the maze game was too similar to their own, and that Atari had the sole rights to Pac-Man on home computer. To be sure, K.C. 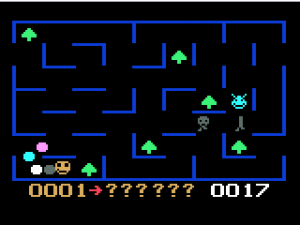 Munchkin had its differences—multiple mazes, a level editor long before editors were common (it used the Odyssey2’s attached keyboard), and dots that roamed the maze itself—but ultimately it was a game in which an impish munching character wandered a maze, eating dots and avoiding monsters. As if driving the point home, with a wink and a nudge, that K.C. really was Pac-Man in disguise, the game even had power pellets that would allow the player to hunt the three monsters for a limited amount of time. Of course Atari won the suit, and K.C. Munchkin was pulled from shelves. Still, the game’s success had blown the door wide open for a sequel. 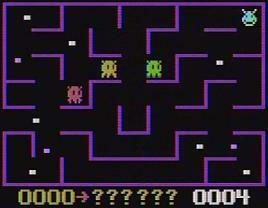 K.C.’s Krazy Chase once again featured the multiple mazes and level editor of the first game, but the gameplay went in a decidedly different direction, pun intended, from that of most maze games. Doing away with dots and power pellets entirely, the only things in the maze besides K.C. himself are two “Drats” (the resident monsters), randomly growing trees, and the Dratapillar. It is this Dratapillar that play fixes itself on, for that monster is both the primary antagonist and the focus of scoring. While K.C. can eat trees, they are each worth a single measly point. Clearing the level instead requires you to attack the beast itself, but because the Dratapillar’s head will kill you, you must go after its body. There are a few ways to fell the Dratapillar. You can nibble away at it from the rear for 3 points apiece, which is safe, albeit slow, and still a bit dangerous as the Drats can trap you. Alternatively—and this is what reminded me of the ghost trains—you can go for the jugular, so to speak, and attack the segments closer to the Dratapillar’s head. This requires you to intercept it as it crosses an intersection, and you have to be wary of it turning to come after you. The trees come in handy here: the Dratapillar is also chomping away on them, and it will slow down to enjoy its meal. Once a segment farther up the Dratapillar is eaten, the remaining segments will stay in place to be eaten by K.C. or, in a brazen and rare videogame display of autosarcophagy, the Dratapillar could well swing around and devour its own body. Eating a Dratapillar segment will also turn the Drats white, empowering K.C. to stun them momentarily for a cool 10 points. Eating the entire Dratapillar body will award 20 points, and this resets the level at a faster speed. The game, then, becomes an exercise in strategy based on the maze, speed, and placement of all the objects. Eating one segment of the Dratapillar and then hunting nearby Drats can build up your score, but you’ll lose position on the Dratapillar itself, and may get killed when K.C. ceases to be powered up. Focus on level-clearing nets a large amount of points, but the speedier game will make it harder to control and maneuver effectively with regard to K.C.’s foes. While many maze games require knowledge of where the pursuing enemies are at any given time, almost none other makes the enemies’ position the entire focus of the game. While the design is fresh, it is the fun visual effects that give K.C.’s Krazy Chase so much personality. Our title hero’s mischievous face rolls around the maze grinning, winking when a stage is cleared; when K.C. is killed, he smiles sadly and waves goodbye with his antennae before receding forever into the gaming void. The Dratapillar itself leers maniacally right up until the level is cleared—then, just a disembodied head, he wears a pained frown. The other Drats, when stunned, spin in a wild circle. 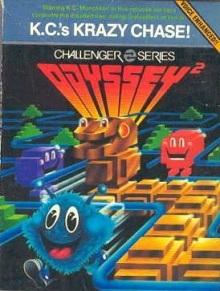 Perhaps even now the Odyssey2 doesn’t elicit the respect of its more popular rival consoles, like the 2600 or Intellivision, but its developers had a knack for making games that retained the feel of popular arcade games, with still enough twists to make them wholly unique. While overshadowed by home ports and exclusives of better known games such as Atari’s Pac-Man, Colecovision’s Ladybug, or Intellivision’s Lock n’ Chase, K.C.’s Krazy Chase was a notable system seller in its own right. And because it is such an innovative bent on the maze-gobbler model, 30 years later, K.C.’s Krazy Chase yet feels new and immediate.